Why Do We Need To Know C.P.R. People go through school and say, “why do I need to learn that?” In reality we use things we are taught in school every day, from simple math for money, to chemistry when cooking. Biology gets overlooked because people use it without even knowing they are. Biology is everywhere and is as important to us as oxygen. The education I have received through nursing, care-giving, and phlebotomy has taught me the simple understandings of lifesaving biology concepts. I am thankful for learning the concepts, because I believe that in life, it is crucial to learn basic health care needs. 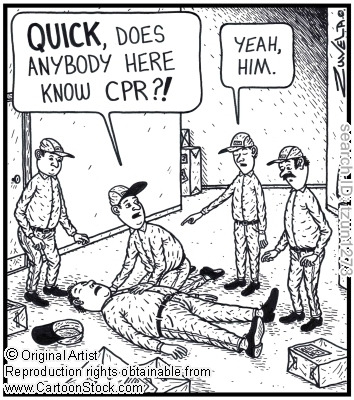 Simple knowledge about CPR and first aid is critical for everyday activities. It surprises me to know how many people are naive about their own body. I have several stories about how biology is useful in everyday life, but the story that effects me the most is the story of my dad, Chuck. My quest for understanding biology started when I was pregnant. In all the commotion and stress of motherhood, I felt lost and afraid of what was happening. I ventured out to educate myself on what was taking place. I didn’t understand how it happened, with my mind in such a state of dismay, my biology still took charge and developed life within my womb. This was the point where my passion for biology took off. I was desperate to be the best mom I could be, and I felt with a good education in biology I could succeed in motherhood. I spent much time at the hospital taking birthing and prenatal classes to better understand the biological changes that were occurring. Soon after the birth of my healthy baby girl, I realized that having a baby with no high school diploma was not the situation I wanted to be in, even with a loving dad to help me out. So I decided to start college. Soon after, I was certified through the state to be a nursing assistant. Being very successful in my schooling as a Certified Nursing Assistant, I continued on to attend school to become a Certified Care Giver. I’ve finally became very familiar with the body and how it works. But still on my quest to be the best mother, I wanted more knowledge. Therefore, I began my education in phlebotomy school. While in Phlebotomy school, my dad fell off of a ladder and broke his back. At that point in time, I moved down the street to take care of him. He had pre-existing conditions. He was a diabetic with high blood pressure. This made the fall a bigger deal to him than to any other person with a similar injury. The surgery went well, preserving his back discs and vertebrates. Every day, I made him diet specific meals. I learned in care giving how to check his blood sugar and blood pressure. I also learned that some people are too stubborn too let their children take care of them. I knew not to force him into allowing me to take care of him. He assured me that he had taken care of himself and he was fine. This went on for while, I presumed everything was going well. One day I was at work and received a phone call from my brother, who lived at home with my dad. My brother had told me that dad gone to his primary care physician for uncontrolled pain. During the visit, the doctor recommended that dad go to the emergency room at the hospital. Being in no position to drive, due high pain levels that caused sever vomiting, the ambulance took him. When I first arrived at the hospital, he was conscious in the emergency room and had already been assigned a bed. I held his hand and talked to him briefly, then decided that I had better stay with him. An hour into the emergency room, he began to seize. The staff could not figure out why he was seizing or how to prevent it. Due to his vomiting and seizures, the hospital staff decided it was in his best interest to put a respirator in to minimize the chance of aspiration during the seizures. With this procedure, they placed him under a local anesthesia so that he would not be uncomfortable and he would remain unconscious. During this time, they had to restrained him with soft wrist restraints so that he would not be able to pull out the tube of the respirator from his throat. With the seizures increasing and his blood pressure being out of control, he was then moved to the intensive care unit. I took the whole week off of work to be by his side. I even helped with his care. Being a C.N.A., I know how important the skin is and the consequences of poor skin care during a bedridden time. Dad spent over a week in the I.C.U. I had watched over all the tests and the results. As time went on, the hospital staff still could not figure out why he was having seizures. As the week went on, his seizing came to be less and finally it stopped. I was there when the staff took the respirator out and he finally became conscious. Knowing the consequences of not having an advance directive, my brothers and I took the first chance we could to preserve his dying wishes. In the past, I did give him the forms to fill out but he never accomplished it. This time it had to be done. My brothers and I spent awhile trying to get his wishes correct. In the situation he was in, it was hard to get his signature, but we succeeded. With that out of the way, we spent the next couple of days talking and watching him become his normal self again. The staff moved him to his own room- out of the I.C.U. against my wishes. Having no diagnosis for his seizures, I had concerns about a potential dangerous remission. Without proper equipment and available staff, the consequences of the potential remission could be catastrophic. A day after his placement out of the I.C.U., he was released from the hospital. The next morning, I had called the hospital to check on my dad’s recovery only to find that he had been released into my nineteen year old brother’s care. My brother did not have any medical background and under the stress of the chaos, he did not contact me when this had happened. I immediately rushed down the street to see my dad. My boyfriend and children had come along for a visit. The hospital did not allow children in the I.C.U. I wanted to ease their minds and give them some quality time with their grandpa. daughter to have my boyfriend call 911. With all the commotion, my brother groggily approached us with confusion as to what was going on. I kept everyone out of my dad’s room, knowing what was unfolding. When I had returned to my dad’s side, I tried to turn him over for CPR. By the stiffness of his body, I knew that regimortis had set in. I had become accustom to taking care of people until death and postmortem. Out of the countless people I have lost, nothing prepared me for what was unraveling before me. In classes, I have learned lifesaving skills that could have prevented this. Working as a C.N.A. I learned to take vitals and evaluations on residents after they arrived home from the hospital. It is very important to watch over the residents to make sure they are stable. The C.N.A. if the residents vitals become unstable. Before I knew it, my whole world had changed. The very thing that I was trained to act upon I was no able to do. Not being able to do anything made me feel helpless. I felt like I could have prevented this very thing from happening through my knowledge. I kept repeating to myself, “Why weren’t you there?” I could have checked on my dad every fifteen minutes, if I would have known. I would have done C.P.R. if I could have been there. I could have called 911, if I had the chance. Racing thoughts of all the “would haves” and “could haves” blinded all my senses. There are signs given when a person is in distress and ways to correct or even prevent further damage from taking place. When a person is having a heart attack, their blood pressure goes up and the heart starts beating erratically. People also give a good indication by how they feel. The elephant sitting on their chest is a clue. The specific action I could have taken was to give my dad a simple aspirin. When having a heart attack chewing aspirin can help break up the plaque in the persons arteries that are causing the heart attack. Knowledge is power and can prevent a lot of pain or hurt if used right. People need to be aware of simple health care needs so that proper emergency care can be provided. Preventing death will in return save a lot of pain. I hope that after reading this you will want to learn C.P.R. to prevent another death. Though I could not change what happened, I am grateful that I could better understand and cope with situation through medical biology.